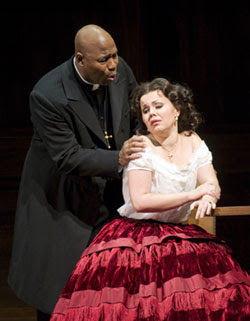 Bass Arthur Woodley is a Seattle Opera favorite, having appeared in 12 productions going back to the 1997/1998 season, when he performed the role of Bartolo in Le nozze di Figaro. 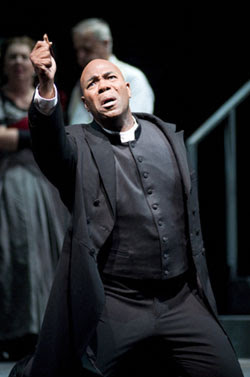 Now he’s back in Seattle as Raimondo, Lucia’s family minister and confidant, in Lucia di Lammermoor. Today we talk to Woodley and get some insight into his character and the production. Let’s start with your character. Is Raimondo one of the “good guys”? After Lucia goes mad, he blames Normanno for all the bloodshed, but it doesn’t appear that Raimondo himself did much to help the situation. Raimondo is a man, a minister, and a conciliator. A good man? I don't think we can put him in an either/or category. He is a man that is trying to bring peace between two factions and happiness to all. He knows it will be difficult and that difficult choices will have to be made. Raimondo blames Normanno because it was Normanno who spied on Edgardo and Lucia and tells Enrico. Why? Because he is ambitious—he wants power and position and is willing to do whatever it takes to get ahead. 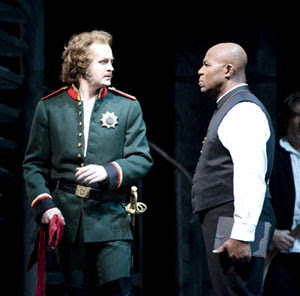 Raimondo confronts him twice in Act 1. So in Act 2, when Raimondo convinces Lucia to marry Arturo, is he just following Enrico’s orders, or does he believe he’s doing the right thing? Raimondo convinces Lucia to marry Arturo because he truly believes that Edgardo, who has left for France, is being unfaithful to Lucia. In his Act 2 recitative, Raimondo recalls how he has sent a letter written by Lucia to Edgardo and has received no answer, which he fears points to Edgardo's unfaithfulness. He has known both Lucia and Enrico since they were children and knew their dead parents. He wants to do the best for the entire family and feels that he needs to secure a concrete future for both of them. Have you performed Lucia before? This is my fourth production of Lucia. Wow! Time flies! This production of Lucia adds the little recitative after the mad scene in which you chew out Normanno for having caused so much trouble. This part is usually cut, so why is it included in this production? We all had a discussion about it. We wanted to know if the recitative offered an opportunity to move the story forward or added an explanation of motives. With the addition of this scene we see that another person was involved in pushing this tragedy forward. You can say it "puts the blame on Mame" or, in our case, Normanno. You’ve been in about a dozen productions with Seattle Opera, going back to the 1997/1998 season, including Le nozze di Figaro, Boris Godunov, Les contes d'Hoffmann, Il trovatore, and many others. Is there any role you haven’t yet tackled that you’d like to? So, since you mention that I have been in productions since the 1997/1998 season, are you saying that I am one of Seattle Opera's ancient men? Truth be told, I can't believe it's been so long. I wish I could single out one great memory with Seattle Opera, but I can't, though I remember my nervous debut in Figaro. The role that I haven't done and would love to do is King Philip in Don Carlo. Vocally, this role of Raimondo in Lucia goes down pretty low. Where does your vocal range tend to lie, and how does it fit with this role? Raimondo is very rangy and I love roles that allow me to use all of my voice. I am a basso cantante, which can also be called a lyric bass. It means that I have the range of a bass with a little extra at the top of the range and am able to sing smoothly (legato) as well. Donizetti has written a role that is both dramatically and vocally satisfying. When I began singing, I wanted to be a Verdi baritone, but with time and lessons we found my true voice and I am so thankful for being a basso cantante.